J.-J. Luthi, Emile Bernard, Catalogue raisonn de l'oeuvre peint, Paris, 1982, p. 42, no. 256 (illustrated; dated 1890). Emile Bernard befriended Vincent van Gogh in 1886, and it was on the Dutch artist's suggestion that Bernard went to work with Paul Gauguin in the Breton town of Pont-Aven in 1888. They hoped to form a utopian artistic community that embraced the primitive culture of the Breton tradition, an alternative lifestyle far removed from the urban influences of secular, industrialized, modern Parisian life. Together, they were fascinated by the local legends, customs, and costumes of the Breton people, their religious motifs and the medieval art of their churches. Flix Fnon identified Bernard's flat colors and bold outlines with Cloisonnism, observing that "the broad lines that M. Bernard uses to mark out pieces of landscape and figures" are reminiscent of "the leaden network of stained-glass windows" (quoted in M.A. Stevens, Emile Bernard 1868-1941, A Pioneer of Modern Art, Amsterdam, 1990, p. 337). Madeleine au bois d'amour, represents the artist's younger sister in the woods by Pont-Aven. This work bears the same title and subject as the artist's monumental painting of 1888. Madeleine visited Pont-Aven during 1888, and modeled for both her brother and Gauguin. In the first version of Madeleine au bois d'amour from 1888 (Luthi, no. 140), she is alone, lying on the ground in the woods. Her eyes are focused skyward in quiet reflection, and the repeated vertical movements of trees emphasize the heavenly focus of her thoughts. In the 1892 version of Madeleine au bois d'amour, Bernard allows the viewer to enter Madeleine's dreams. She is shown in three-quarter view from the shoulders up, much like Bernard's other portraits of her from 1888 and 1889. Behind her, a tree twists in decorative arabesque curves towards another woman who grasps at its branch. Like Gauguin's famous La vision aprs le sermon, 1888 (Wildenstein, no. 245), this enigmatic second figure seems to be a vision in the mind of Madeleine, as the tree literally sprouts from the top of her head. 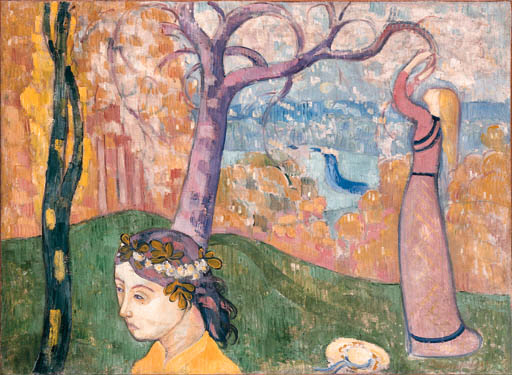 The luminous colors and decorative forms come from a magical, mythical realm beyond everyday reality, and the romantic imagery embodies what Mark Roskill called an "iconography having to do with springtime and virginity" (M. Roskill, van Gogh, Gauguin and the Impressionist Circle, Connecticut, 1970, p. 100). Le bois d'amour actually becomes a Garden of Eden, and the second maiden, like Madeleine, is a modern day Eve contemplating the apple. Indeed, Bernard was so preoccupied with this theme that he also painted Adam et Eve (Luthi, no. 265) and La cueillette des pommes of 1890 (Luthi, no. 260) of Breton women picking apples. Madeleine au bois d'amour embodies Bernard's artistic innovation as well as sentimental reverence for his sibling. Madeleine passed away only five years after this painting was completed, and Bernard reflected, "No mind was better suited to harmonise with mine and no heart better suited to understanding in all its divinity my most profound inclinations and needs. She was an image of heaven" (quoted in M.A. Stevens, op. cit., p. 194). *This lot may be exempt from sales tax as set forth in the Sales Tax Notice in the back of the catalogue.